The App Store is home to many great educational apps. Even so, new ones still pop up every day that try to introduce our juniors to new things; from writing to calculating and even painting to programming, there seems to be an app for every topic imaginable. As an app reviewer, I find new apps with different themes every day. Based on my observation, most of them tend to go with cutesy animals or fantastic adventures. Thus, it was a pleasant surprise to stumble upon Grandpa's Workshop, an educational app which features a cheerful elderly gentleman as their mascot. Grandpa's Workshop review - An activity app for juniors with a unique theme and lovable mascot. 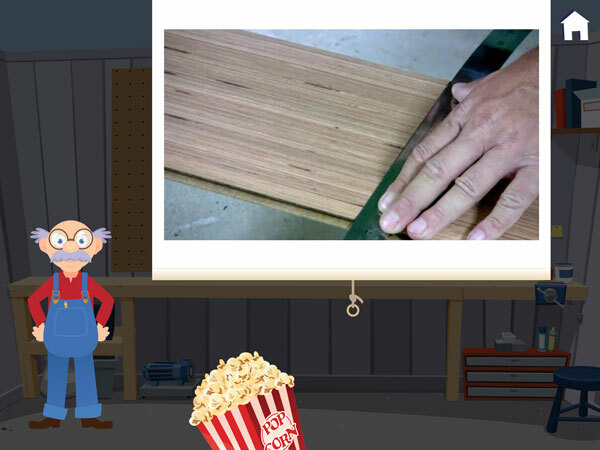 Grandpa's Workshop is an activity app comprised of seven mini games built around the theme of working with tools in the workshop. Designed for juniors aged two to six, the app contains simple activities to test a range of skills, including numbers and fractions, vocabulary, spatial reasoning, colors and observation skills. As suggested by the app's name, the central character is a kindly Grandpa who builds and fixes things in his humble workshop. More than just a mascot, he acts as a guide as you complete the tasks at hand. The mini games themselves are quite simple and can be thought of as assisting Grandpa as he worked. Among others, children will be finding out which jars contain the right number of bolts, guessing the length of a board using a tape measurement, identifying tools by their names, and painting furniture. There's also an activity similar to a jigsaw puzzle as you piece together Grandma's broken dinnerware and garden gnomes. As a reward for your hard work, Grandpa will build you clubhouse from scratch. As the construction is built in several phases, you must go through several rounds of mini games before you’re able to see the clubhouse standing proud and tall. Seven mini games are present in the app for practicing various skills. In this activity, children can practice spatial reasoning by piecing together broken objects. Grandpa's Workshop is a great activity app which attempts to help juniors practice a range of skills and knowledge. Seven different types of activities are present in the app and are rotated evenly. However, if you'd like, you can mix and match the topics you want your juniors to practice in the Settings menu. Acknowledging its target audience, the app utilizes a simple user interface design with big menu buttons and easy game controls. To complete the activities, only simple gestures such as tapping, dragging and smudging are required. Instructions for completing a task are read aloud by Grandpa at the beginning of each game and are also written in bold at the bottom at the screen. Visual hints, such as an animated hand icon to show smudging or dragging on the screen, are also shown to help juniors get started. As I mentioned previously, the app includes (offline) videos of real handymen working with tools. As these tools are not suitable for juniors to use, the app provides a reminder that they are off-limits and should only be utilized by adults. As parents, you can use this opportunity to discuss with your juniors about home repairs and work safety. Grandpa's Workshop is a great app that I think would fit great especially with the boys. With its unique theme, the app stands out among other activity apps for juniors. The included videos of how tools are used at work are priceless - I have yet to see other apps discuss about these topics before. In addition the unique topic, the mini games also provide a great way to sharpen basic skills. While I do wish that there were more content, especially in the painting activity, these games are quite varied and would keep juniors playing for a while. The clubhouse makes a nice reward, but I would prefer that the developers make it possible for juniors to visit it after they have completed all the tasks. Finally, I liked how the developers successfully created an excellent and lovable character that will appeal to juniors. Having reviewed many apps with animals as their mascots, I appreciate how Grandpa's Workshop uses a relatable character that is close to juniors. I liked how Grandpa has such positive attitude, always giving out praises whenever a task is completed correctly. I also liked the way he asked for a high-five by tapping on his hand on screen - I thought it was a lovely touch. The voiceover for Grandpa is also wonderful and exactly what I imagined a kind grandpa would sound like. Included in the app are videos of handymen working with tools in a real world setting. Grandpa's Workshop is a nice activity app with a unique theme and likable mascot. The games included are great for sharpening a wide range of skills, and while I wished there were more content, I believe the app is already enjoyable as it is. If you liked the app, I think you would also enjoy Grandma's Garden, another activity app with a gardening theme.